Now the serious stuff, This last week a couple of Retired,Successful Engineers came over. 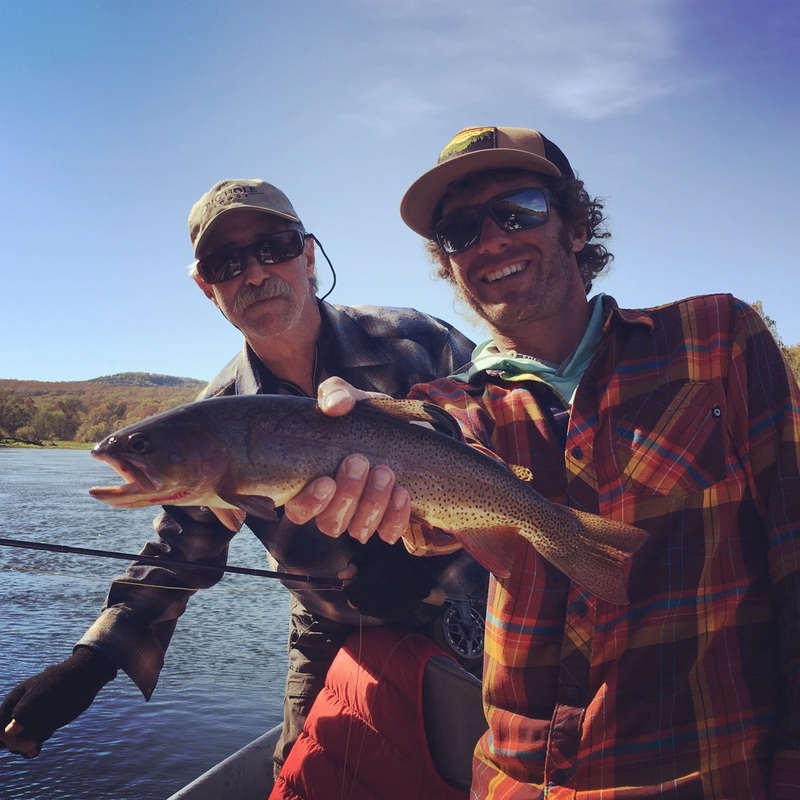 One from out west, the other from Nathanael Ferguson’s (Two Rivers Guide, Ferguson Fly Fishing) old stomping grounds. These are the type of folks that book 2-3 days to make sure they get at least one day of good weather and good fishing. They really did their homework, had the plan made and were ready to execute it, True Professionals! Neither Nathan nor the River disappointed them at all. Sunday was a little overcast after the rain but that was the worst of the weather. 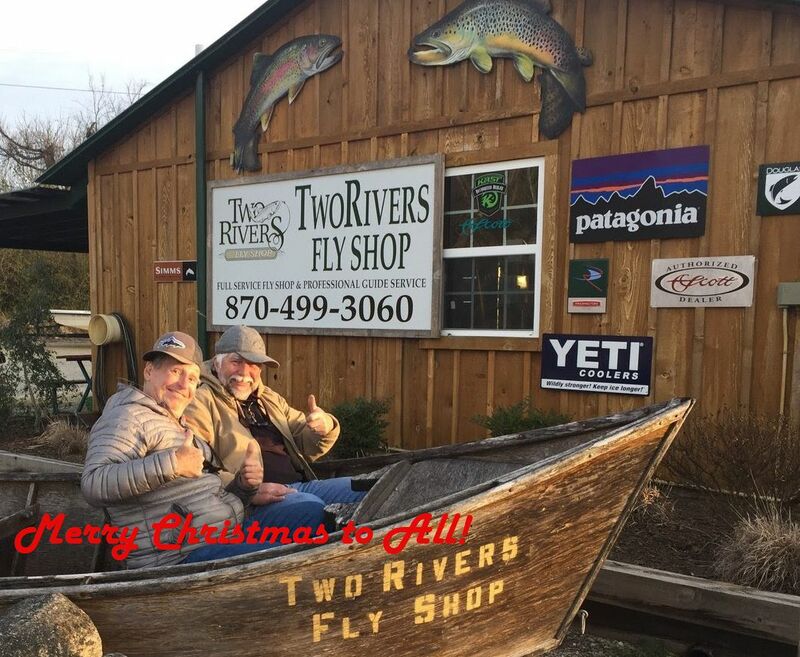 After catching lots of Fish and enjoying their stay immensely,they decided to create the perfect Christmas Card to show their Friends and Family just how Professional they are, remember these are Highly Educated,Successful Engineers, then look at the photo ….. these guys just know how to have fun! Betting that Nathan had a great time showing them ours Rivers! 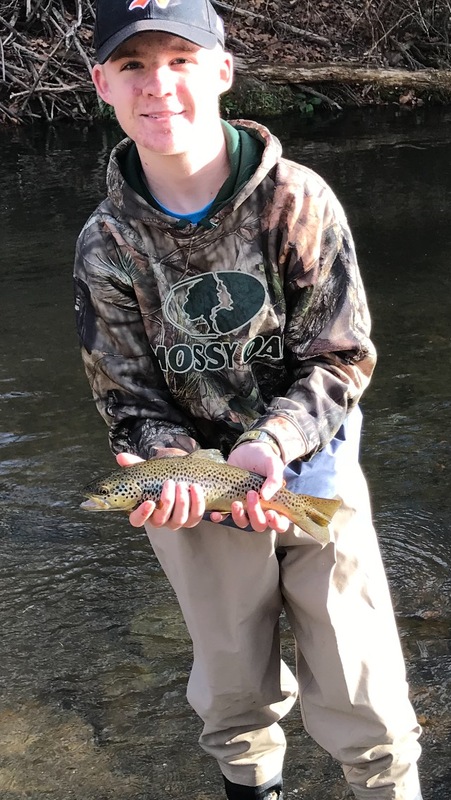 While you and I were having “Way Too Much Turkey”, followed by naps during football games, there were a bunch of families taking their Youngsters out for a day or two of the Dry Run Creek Experience. Once again there were many Fish caught, many Happy Youngsters, even happier Parents, and Grandparents. Some came into the shop bought a couple things, then headed up there. I know Richard gave some volunteer hours to some of the folks and they seemed very happy that he did. 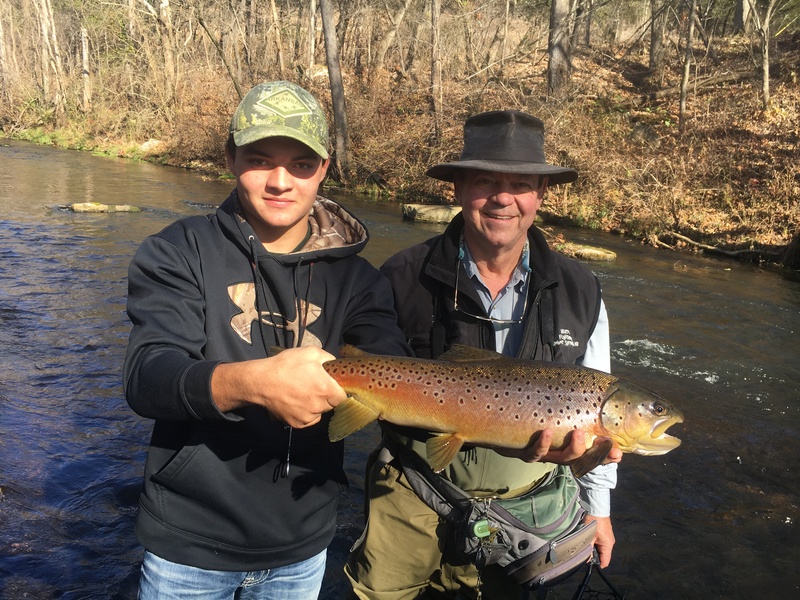 Between Steve and Richard (the two best volunteers at Dry Run Creek) there are many, many happy families leaving our North Arkansas Jewel.Check out all the photos …. Some really happy folks!!! 5. The Monkey Island Catch-and-Release Area on Bull Shoals Tailwater has been removed. We will be working with our Communications and Education Divisions to provide information and educate anglers about the new regulations that will take effect January 1st. I respectfully request that as stakeholders of these resources, that you will please work with us to advise your families, friends, clients, and guests about the new regulations. 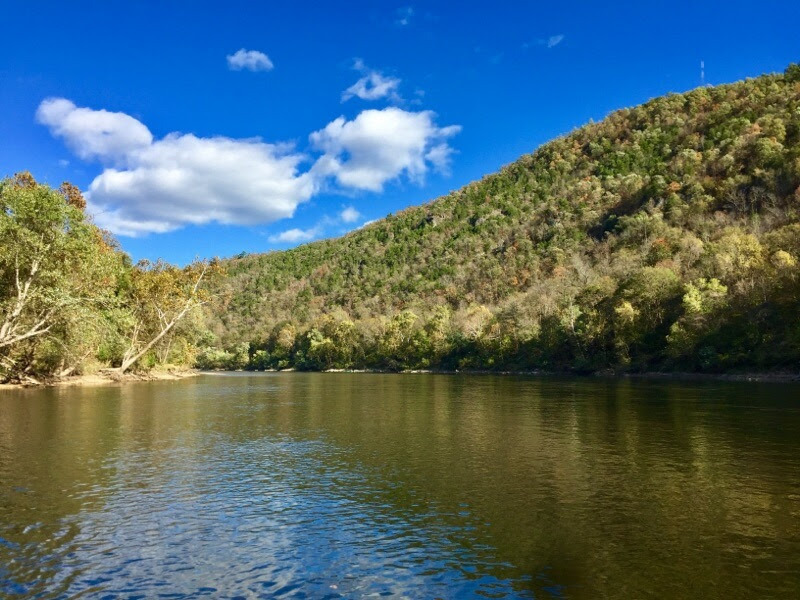 As a reminder, the objective of the proposed regulations and the intent of the public workshops in August was to solicit input that will help us in revising the management plans for the Bull Shoals and Norfork Tailwaters. 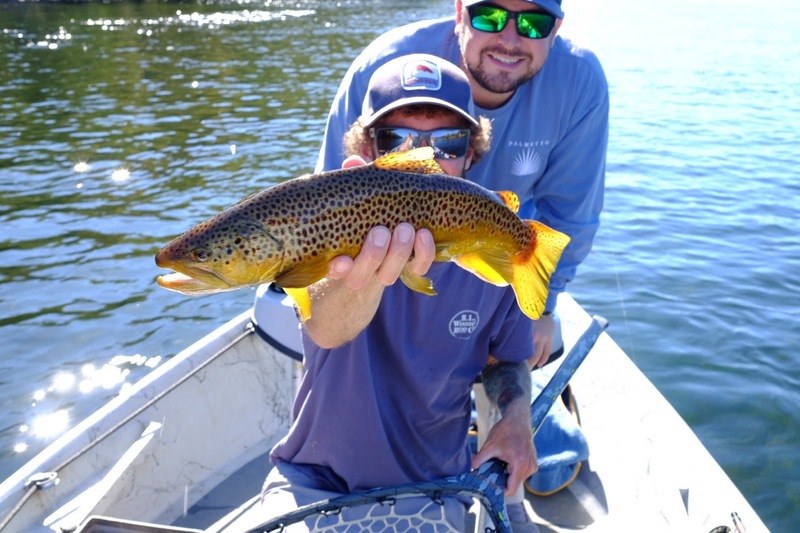 The management plans are away to establish goals and objectives that address the full range of angler desires and expectations for the fisheries. We are still working to revise the plans and will hopefully finalize them by the end of the year. Regulations that were approved today will be incorporated into the revised plans. I’ll keep you posted with more information on the development ofthe management plans as it becomes available. Thanks to all who participated in the public input process. 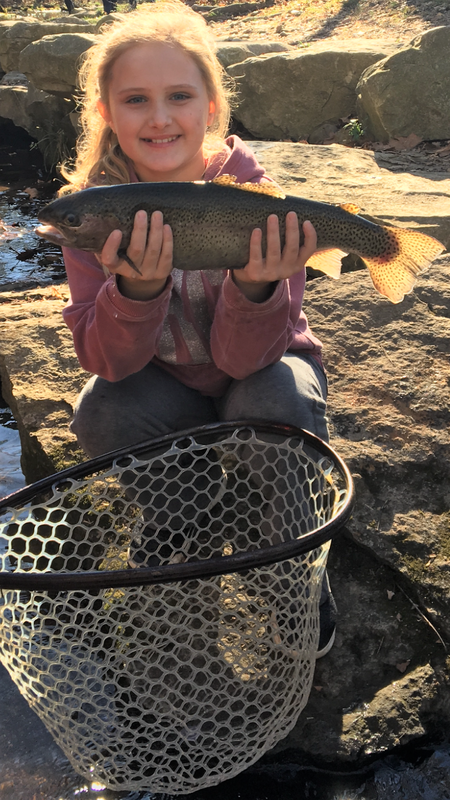 We believe the regulations that were approved today will go a long ways towards providing more quality trout fishing opportunities on the rivers that will benefit all users. Please let me know if you have any questions. Warning, this one is kinda long …. First and Foremost,everyone wants to know what the water is like …. Norfork River Tailwater has been mostly at Minimum Flow (200-210 cfs), 2-3 hours of generation daily (3212 cfs). Dissolved Oxygen levels fluctuate from 6.8 mg/l to 7.8 mg/l (not great but not bad at all, below6.0 mg/l AGFC does not stock). Water temps are 60 – 61 degrees, little warm but not bad. Water is definitely stained (think 2 thirds water, one third chocolate milk), but is getting cleaner/better. 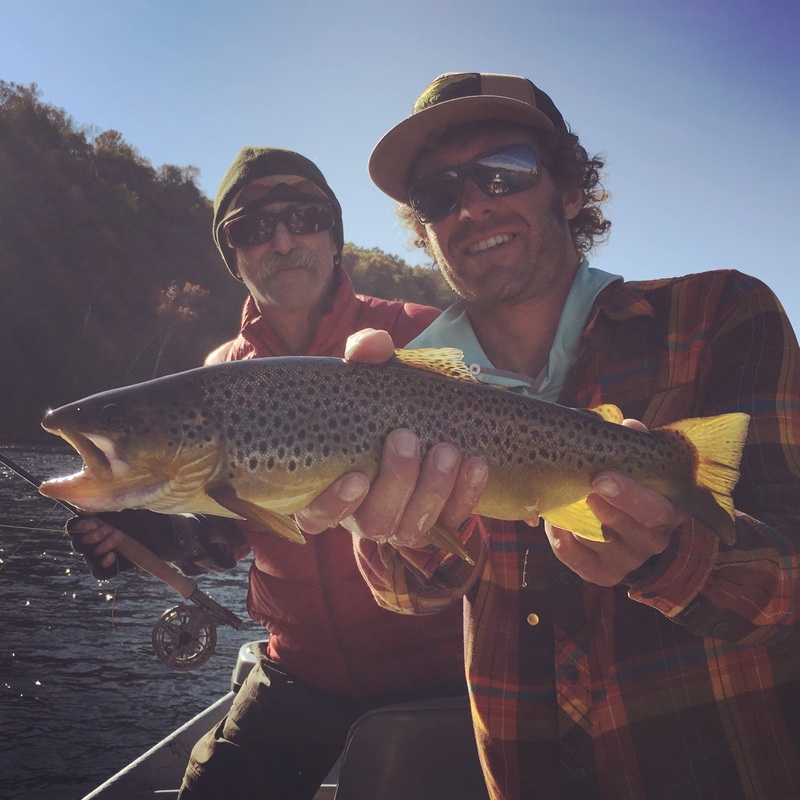 Guides and Customers are reporting Good Fishing, with some people just not having as much luck as they prefer. There have been reports of Redds being cleared out, so Please be careful when wading,give em space to do their thing! White River Tailwater has been steady flowing, steady generation at approx. 3000 cfs (Bull Shoals Dam reporting has been “broke” for a long time, they say their trying to fix it but ….) Dissolved Oxygen levels are fluctuating between 6.0 mg/l to 7.0 mg/l (again not great but not terrible). Water temps are between 61 and 62 degrees (not good, but not bad either). Water is clear, wading is very limited. 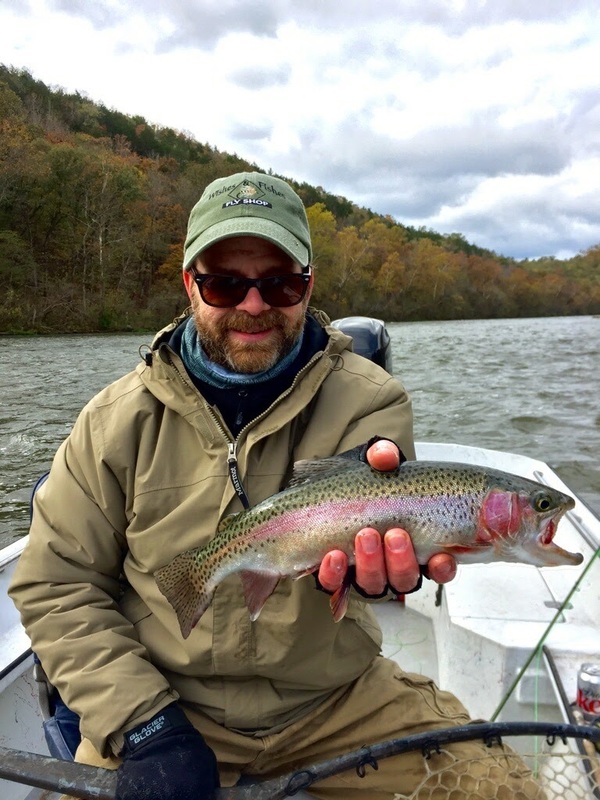 Again Guides and Customers are reporting Good fishing. *Note: Dissolved Oxygen levels are reported at the dams gauges,so further down river they will be dropping, with no reports of bad conditions. 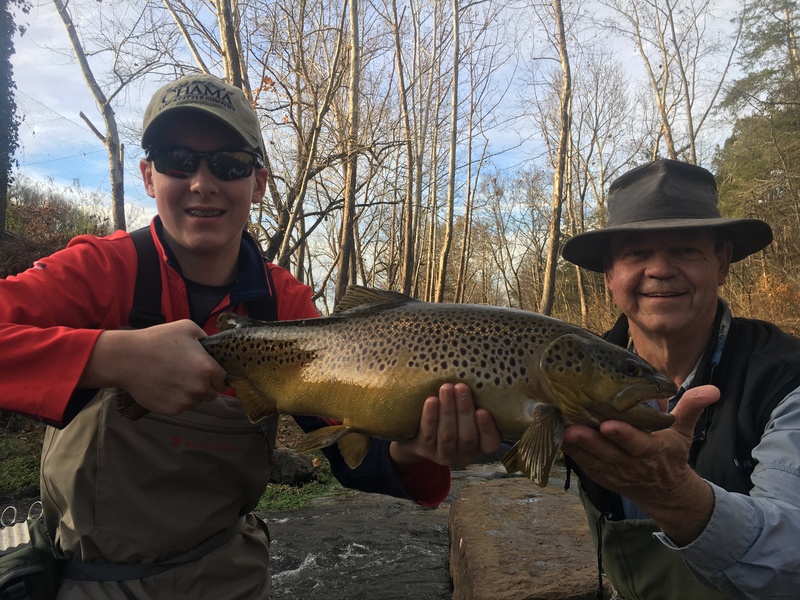 That’s all the “Oh-Fish-al” information I can report, so now we’ll get to some FISH …..
Dominic Zametto (Two Rivers) had clients that enjoyed theirday, some of his clients came in and explained to me that they just plain “Wore em out!”. Really liked hearing that! They must have done well, cause Dom just isn’t a photo kinda guy. 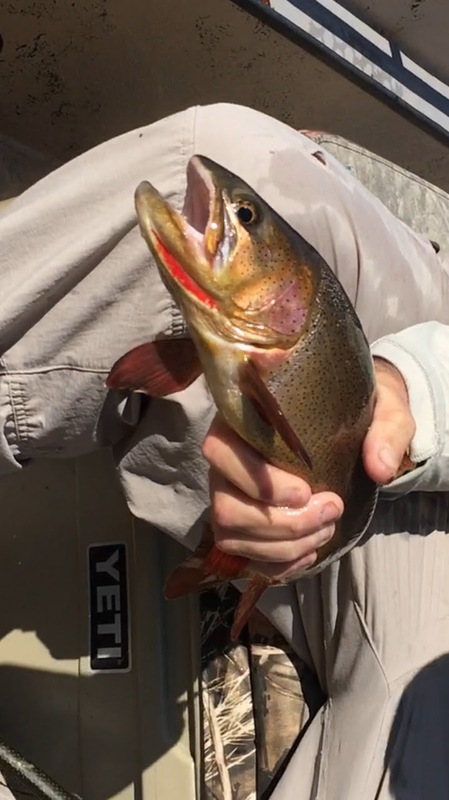 A nice Cuttie, and a real nice Brown …. To show off some of their results! 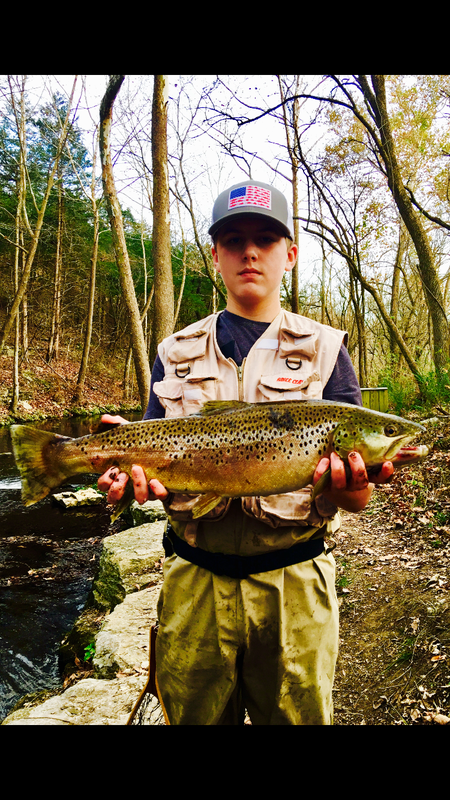 Nathanael Ferguson (Two Rivers, Ferguson Fly Fishing) sent me a “Scenic Photo”, a fat Bo-Bo, and a couple really nice Browns. Again Happy Clients, that had to tell me how good their days went (noticing a pattern here aren’t you). So if Brad Smith (Two Rivers, AR Headhunters), Barry Annalora (Two Rivers), Clint Wilkerson (Two Rivers), or Larry Babin (Two Rivers, Hogs on the Fly) had any stories I had already walked away with my hands in the air, sayin “I don’t want to hear it!” Guess I really need to get out on the water and make My own stories, then I’ll be right back in there with em! Some of you may know, some don’t …. I have been in Savannah,Georgia, off and on for the past couple months. Old Career Life raised its head. 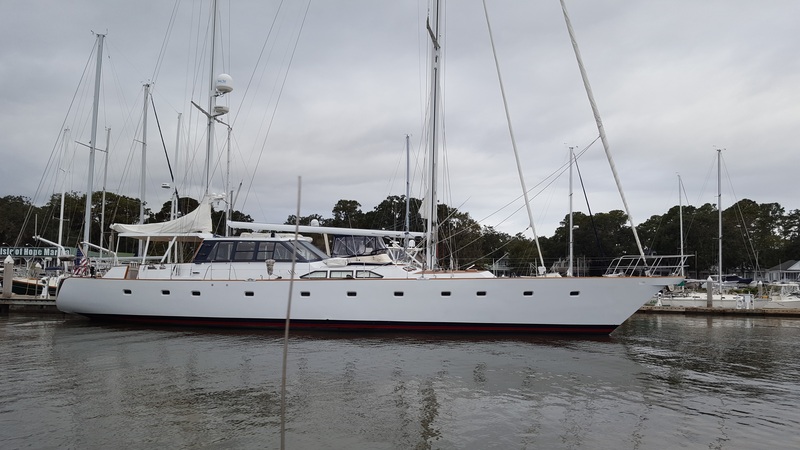 Anyway, last weekend I got to visit with some very “Salty” folks, on a really nice 93’ Superyacht. Before you start thinking that they might be a little “uppity” for this “Exalted Fly Shop Bum”, let me tell you a story. They invited me to a “Dockside Oyster Roast”. These folks had 2 very large Coolers full of Oysters, another couple Coolers with cold Adult beverages, Grilled Brats and Italian Sausages, Buns and several different sides. The Oh-Fish-al “Roaster” is a retired US Army Ranger, with a story for every occasion. The Captain of the Yacht and several others Love to Fly Fish, so there are a multitude of stories, then all those “Salty’s” wives/girlfriends, they got right in the middle of things and just shook their heads when the stories got a little bigger than they should, and they actually tried to keep a straight face. Nobody ever got even a little obnoxious and everyone welcomed anyone that came walking down the Dock …. Lots and lots of “Here y’all, eat this” …..This is one memory that I will always cherish …. Some really Great folks! One of the most memorable stories is about their Stone Crabs. Down here on the coast Stone Crab Claws are a delicacy, people run Crab traps as long as they legally can to get as many as the Law allows. Some folks have a slightly different method that reminds me of our area. 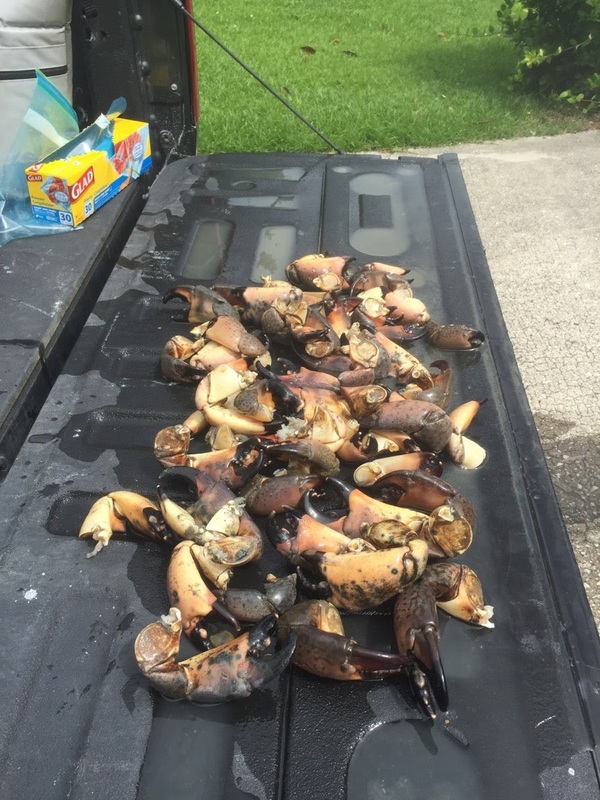 “Stone Crab Noodling”: You wait for the lowest Tide of the season, get you some knee/elbow pads at the Home Depot. 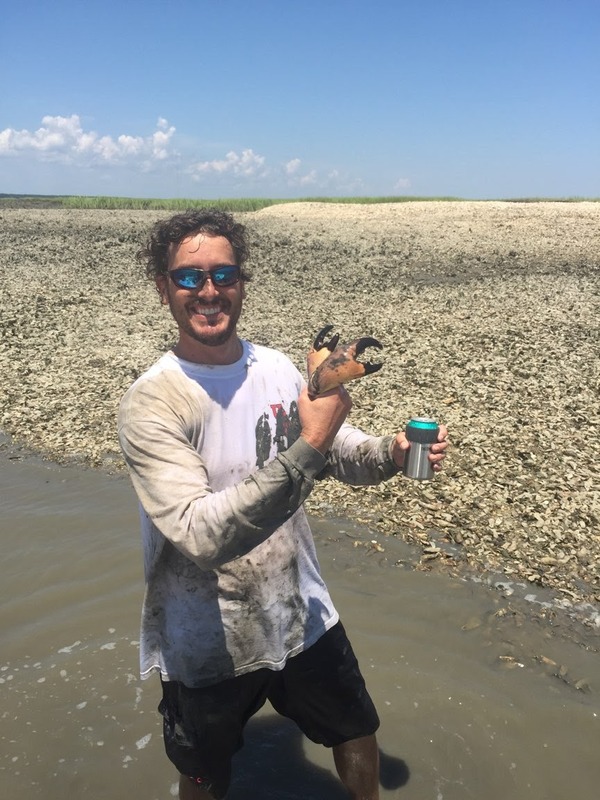 Get out to the Oyster Bars, start looking for crab holes, crawl up to the biggest holes and reach down into each hole and find the Stone Crabs. When the Crabs are in the hole their claws are folded, so, you get a finger into the corner made by the joint,and pull em out. Sounds easy, but imagine the muck your crawling around in not to mention the oysters your laying on, and that is if the holes is above the Low Tide water line. You are reaching into a hole as far as your shoulder will allow trying to get something you can't see, but there you are. Now, once you get them out of the hole (against their will I might add) they can swing that free Claw around and pinch the ever loving s#*t out of you,so you gotta be quick to catch that claw. Then you decide which Claw is the biggest and break it off at the joint. Now you can put the Crab back in the hole, they’ll grow back the Claw you removed and you can “git em” again ... kinda like "Catch and Release" but you get to eat some too! 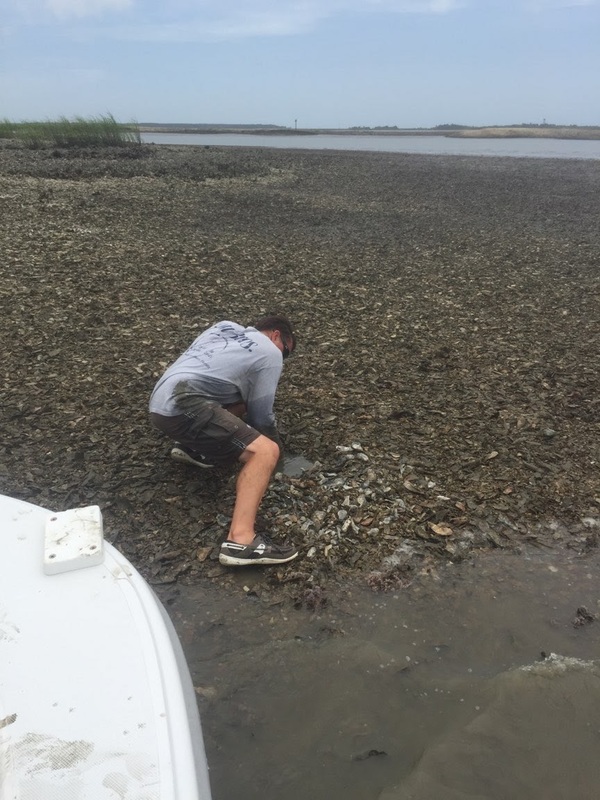 Needless to say there are many cold Adult beverages involved in all this action, so at the end of the day, or before the Tide comes back in, you head back to the Dock and “Steam” your catch and just plain enjoy the treasure of Fresh Stone Crab Claws. You may try to be nice but these things are too good to share with just anybody …. Jus sayin …. By the time the teller got thru with his story, there was a line of folks wanting to go the next time he went. He did tell a couple folks that he would take them, but didn’t sound too specific about where they would be going. When I left the dock that evening it dawned on me that Good Ole Rednecks are just Good OleRednecks, no matter where you are …. So if someone asks you anything about Stone Crab Noodling, tell em, we may not have Stone Crabs but we got just the Boys to “git in there a get er dun”! Ain’t it Great to be a Good Ole Redneck! Well, we have seen some Minimum Flow on the White River and reliable Minimum Flows on the Norfork. The Bull Shoals Dam current forecast for Bull Shoals is 1-2 generators all day Friday (October 20th), but SWPA will not release the weekend forecast until Friday after 4:00pm, maybe, just maybe there will be changes to what has been the “Norm”. 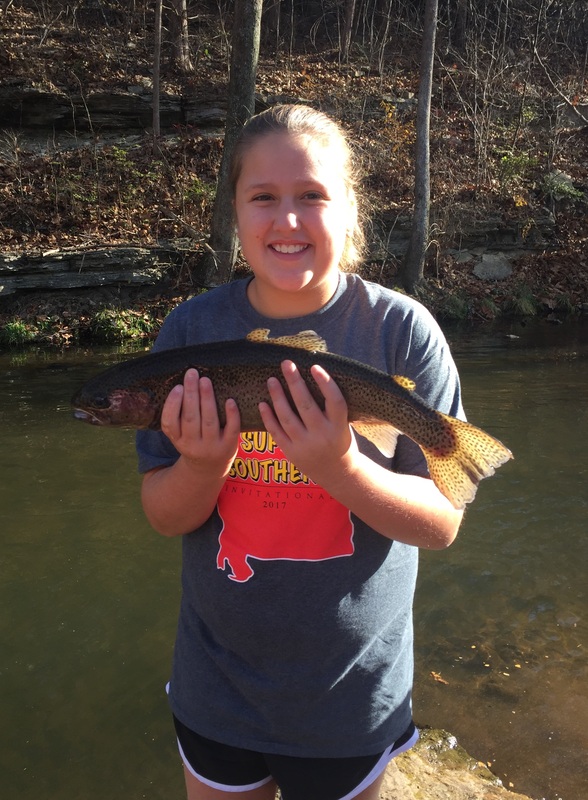 Guides are still working the “Low Water”and are still catching Fish …. Hoppers, Midges are still producing, but you may need to down size to get a bite on Streamers (think Wooly Buggers size). The Norfork Dam forecast is remaining similar to what has been running. Minimum Flow till 3:00pm, with a few hours of 1 generator in theafternoon. I would expect this to continue for the short term anyway. 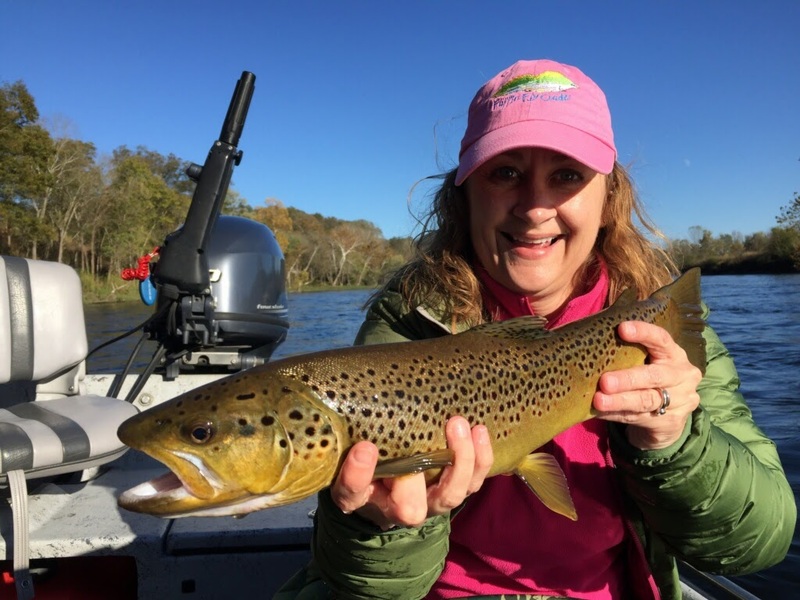 Wading has been good and the Guides are still working the River, making memories for their Clients, and putting Folks on the Fish “Hot Spots”. Again SWPA will release their weekend forecast on Friday after 4:00pm …. But I would not expect any changes. 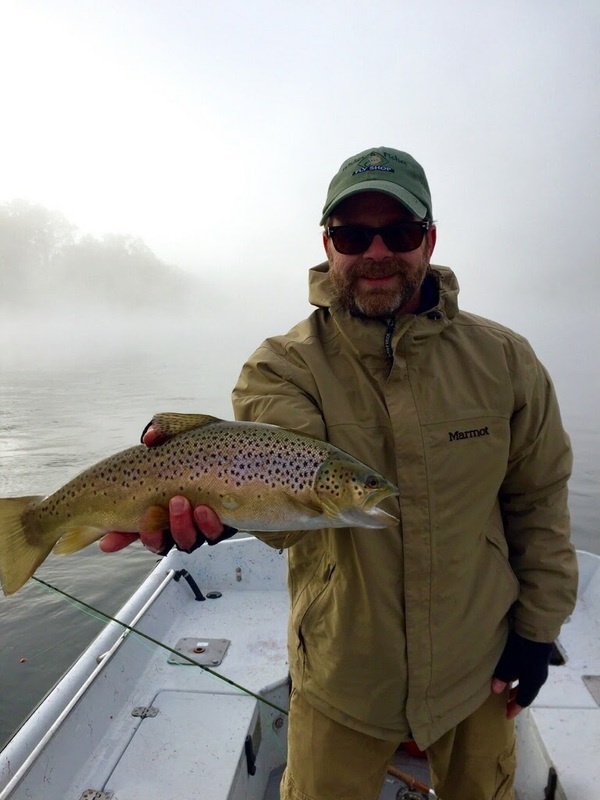 Barry Annalora is originally from Upstate New York (we try not to hold that against him) and grew up fishing Lake Ontario and many of its “Feeder Rivers, and Creeks”. His working career brought him to North Arkansas, and it stuck …. Don’t think he’ll make his home anywhere else now. 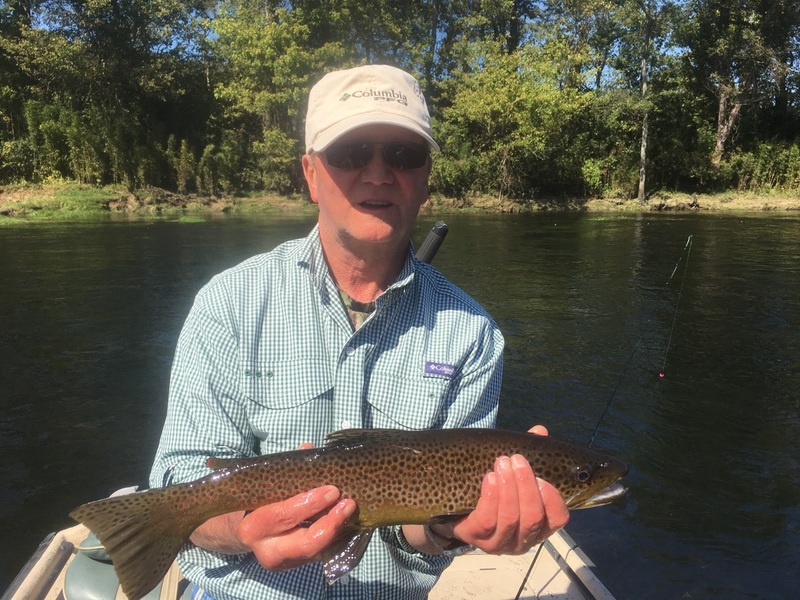 Barry does volunteer work with Christian Outdoor Alliance, working with youngsters to help them with Hunting Fishing and just plain Outdoor skills while mixing in Christian Leadership and beliefs. This is a quality group of people, mostly volunteers and I’d bet Barry is proud to be part of their group. While he is one “Very Fishy Guy” he usually is somewhat subdued, but that Upstate New Yorker does come out sometimes (he’ll have to fight that all his life, heeheehee). 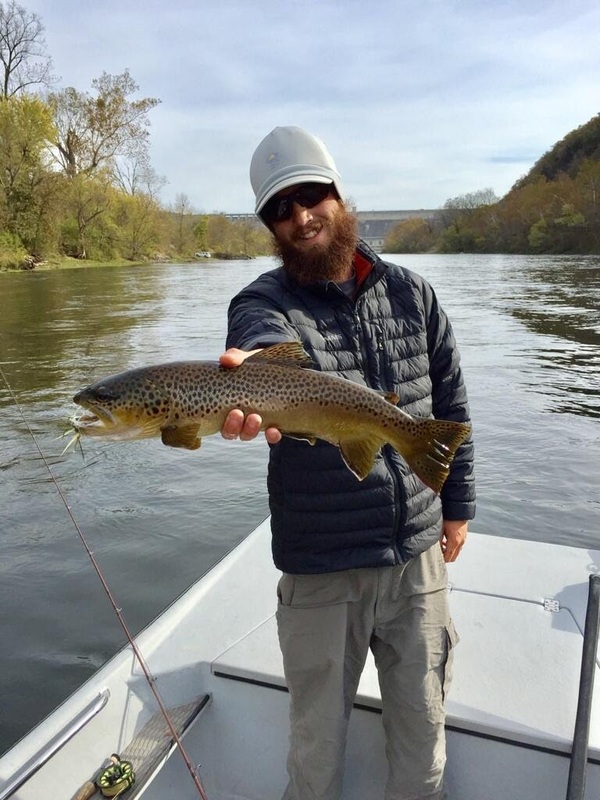 He has caught and released numerous over 25” Fish here in the area, and many, many of his clients have let me know he helped them work ‘em over. If you would like to have one of those memorial days, call the shop or setup a trip online …. I’m sure Barry will be happy to find an open seat in the boat for you. The 22nd Annual Hillbilly Chili Cook-off andFestival is at Bull Shoals White River State Park on Saturday October 21st.There will be a Car Show, Arts and Crafts, Chili Tasting, Live music and The Cutest Chili-Dog Contest … oughta be a Big Time! War Eagle Fall Craft Fair ….. we all know this is HUGE! It’lltake at least a day just to tour, much less really check out all the vendors! It’s a great time to be in the Ozarks and take a day Fishing, or taking a Drive up Push Mountain Road, if you do take a drive stop in Gravity BrewWorks and have a cold one …. Tell ‘em I sent you maybe they’ll laugh while pouring you a Cold Brew!